Anthony Lequerica, PhD, is the recipient of the 2018 Dr. Joshua B. Cantor Scholar Award. The award was established in honor of Dr. Joshua Cantor, a board-certified rehabilitation psychologist whose clinical research focused on cognitive fatigue, sleep deprivation, and exercise after Traumatic Brain Injury (TBI). Dr. Lequerica is a senior research scientist and neuropsychologist in TBI Research at Kessler Foundation, and co-investigator for the Northern New Jersey TBI Model System. 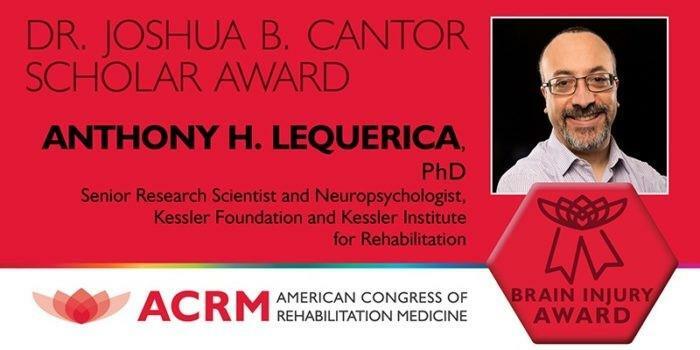 With this award, ACRM recognizes his outstanding contributions to advancing research in the field of brain injury rehabilitation. Sleep/wake abnormalities are common after TBI and frequently affect functioning in various aspects of life. This can magnify any already existing cognitive difficulties and interfere with engagement in rehabilitation therapies, interpersonal relationships, employment status, and overall quality of life. "One line of my research is focused on continuing the work that Dr. Cantor started to look at the relationships between insomnia and fatigue after TBI. His contributions in this area are many, and he has left a wealth of information to build upon in order to better understand sleep disturbance after TBI and use this knowledge to generate effective interventions to address the needs of TBI survivors. I am honored to be associated with the work of Dr. Cantor, who dedicated his career to improving outcomes for people with brain injury and their caregivers." The award recognizes professionals whose work embodies the spirit of Dr. Cantor's endeavors and achievements, which aimed to provide solace, meaning, and hope to individuals with TBI. Dr. Lequerica's clinical accomplishments and body of work, including past collaborations with Dr. Cantor, share this vision. Dr. Lequerica will accept the award at the annual BI-ISIG Summit during the ACRM Annual Conference, Progress in Rehabilitation Research, Monday, October 1, 2018. He will also be acknowledged at the Henry B. Betts Awards Dinner and Gala. Anthony Lequerica obtained his doctoral degree in clinical psychology with a specialization in Neuropsychology from Wayne State University. He completed a two-year post-doctoral fellowship in the Advanced Rehabilitation Research Training program sponsored by the National Institute for Disability, Independent Living, and Rehabilitation Research at the University of Michigan. He holds a dual position at Kessler Foundation and Kessler Institute for Rehabilitation as a Senior Research Scientist and Staff Neuropsychologist, a position that enables him to pursue his research interests and provide neuropsychological services for individuals recovering from traumatic brain injury and other neurological conditions. His major research focus lies in the field of physical medicine and rehabilitation, examining sleep/wake abnormalities after brain injury and their impact on cognitive functioning, fatigue, and engagement in rehabilitation therapies. Dr. Lequerica is also a Research Associate Professor in the Department of Physical Medicine and Rehabilitation at Rutgers, the State University of New Jersey. Additionally, he serves as co-chair of the TBI Model Systems Cultural Special Interest Group and is an active member of the Sleep/Wake/Fatigue Special Interest Group. His research has been funded by the National Institute on Disability Independent Living and Rehabilitation Research and the New Jersey Commission on Brain Injury Research. He is a member of the Hispanic Neuropsychological Society and specializes in the study of the delivery of neuropsychological services to Spanish-speakers, and how cultural issues impact brain injury rehabilitation outcomes. He has authored or co-authored more than 40 peer-reviewed publications and has given numerous presentations across the U.S. and abroad to researchers, health care professionals, and individuals with brain injury and their families.